riving around Oriental I cannot help observing the dying white clover along the roadside. Apparently white clover is now a weed, a designation that warrants death by herbicide. The Town has been busy spraying the right of way to rid us of this pesky plant. I’ve been around long enough to remember when garden centers sold grass seed that included clover seed as an important part of the mix because clover can make nitrogen in the air usable by plants. Plants love nitrogen, but often have a hard time finding enough even though 78% of the air is nitrogen. The problem for most plants is they cannot use the nitrogen in the air because it is in the wrong form. 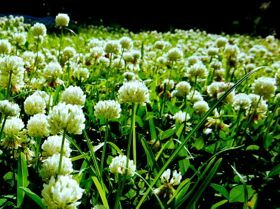 However, many, many eons ago some clever bacteria, who knew how to make nitrogen in the air usable by plants, struck a bargain with plants such as clover. If clover would give the bacteria sugar the bacteria would give it nitrogen. This relationship is so good that bacteria growing in the roots of clover provide more nitrogen than the clover can use to the benefit of other plants such as grass. Free fertilizer for the lawn is a good thing for home owners, but not so good for companies that sell fertilizer. What if they could convince homeowners that clover is a noxious weed and sell them a product that would kill this noxious weed? Without clover to fertilize grass for free then homeowners would need to purchase fertilizer from the same company. A good deal for the company but not a good deal for clover, and certainly not a good deal for homeowners. Enter clever marketing that shows the “weed” free lawn as the envy of the neighborhood. Why have lawns with lots of different plants when you can reduce your diversity to one so it looks like a putting green? Of course with only one species of grass there is the risk of insects or disease killing all of it, but fear not because the same company that teaches us to love grass and hate other small plants will eagerly sell us insecticides and fungicides to kill the insects and fungi. Then, of course, there is “collateral damage”. On my street there were several beauty berry shrubs growing along the roadside. They were so beautiful I was tempted to dig them up and move them to my yard. I wish I had because now they are dead. And then there were the yellow irises that naturalized in the ditch that are now dying. More collateral damage. The herbicide being used is called selective because it does not kill grass, but it does kill all other plants. It makes a person wonder why grass is the favored species, but we know the answer. Marketing. Honey bees love clover (and other broadleaf “weeds”), and honeybees are in trouble across the country. Fewer clover plants mean fewer honeybees. I know that sometimes we step on a bee and get stung, but for most of us it is an inconvenience that can be avoided by wearing shoes. Lots of other insects such as butterflies and moths can be seen on clover and other broadleaf plants, and they enrich summer for all of us. There are lots of plants and animals we can share our lives with, and we are the better for it. It really does not make sense to be convinced by people who want to sell us stuff we are better off by growing only grass in our yards, that we are better off to buy and spray herbicides to kill every other type of plant, and that we are better off to buy and use fungicides and insecticides to correct our own foolishness. That being said I still like clover, and I’m saddened to see attempts to spray it into oblivion. On a more positive note I suspect clover will likely still be here long after our time has passed as a species. 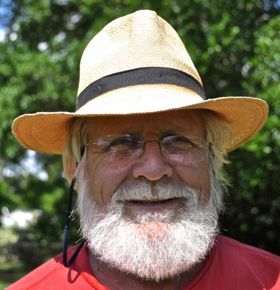 Bob Miller is a retired professor of urban forestry and volunteers with the Oriental Tree Board, which he chairs.